October is the month of the Holy Rosary! One of the main reasons is October 7 every year is the feast of Our Lady of the Rosary. This feast was introduced in 1571 by Pope Saint Pius V (1504-1572) in honor and gratitude of the Blessed Virgin Mary for her intercession resulting in the miraculous victory of the Christian forces on October 7, 1571 in the famous Battle of Lepanto. The Pope strongly believed that it was more of the power of prayer of the rosary than of the weapons and valor of the soldiers. Historically, there were several other battles where the rosary was prayed while the soldiers are fighting to resist the invading enemies and the Christians ended up victorious! Because of these the devotion to the praying of the rosary and the dedication of the month of October to its prayer spread throughout Christianity. Since the development of the Rosary as a prayer, its effects has never been doubted and has fast identified with being Catholic. Modern times has also seen lots of witnesses of prayers answered because of its recitation. My own personal experience way back in February of 1986 in Manila, Philippines was another proof. I was already an ordained deacon at that time and was just two months before my ordination to the priesthood when the so called People Power revolt erupted. Two of President Marcos men, his chief of staff and minister of national defense together with some soldiers revolted against the dictator (he has put the Philippines under Martial Law since 1972). They were about to be attacked by the Philippine Marines loyal to the dictator when the late cardinal of Manila, Cardinal Sin (that’s his last name being of Chinese origin) announced over the catholic radio to help support the rebels. The response was tremendous! You can feel that the people are already fed up with the abuses of the military and the people want freedom. An estimated over two million people surrounded the camp to protect the rebel soldiers against the loyalist forces of Marcos. There were priests and seminarians in their cassocks, and nuns in their habits, together with millions of lay people most of whom were bringing with them their statues of the Blessed Virgin Mary or the statues of the Child Jesus and their rosary beads and almost everybody was praying. The revolt lasted for three days and two nights and the two nights that I was there it was like a religious gathering as most people are lighting their candles and saying the rosary. There were several touching moments when the marines loyal to then president arrived with their guns and artillery tank but were barricaded by the people who offered them flowers and rosary beads! On the third day, after they failed to disperse the people, Marcos and his family fled to Hawaii! It was victory for the people, but we believe it was victory for the power of prayer, especially the rosary! Some people called it People Power! But most people called it and believed it to be so as Prayer Power! As to how the rosary started, most historians agreed it evolved gradually. The monks during the early times have already started praying by reading the 150 psalms, which is also develop into the liturgy of the hours. But most people by then could not read and write, much less they did not possess the bible or at least the book of psalms. In place of the psalms people started to pray the Hail Marys substituting the 150 Psalms. Being a shortened simplified breviary, even today it is still called Mary’s Psalter! Then it was believed that its devotion was spread by the Dominicans. “According to an account by fifteenth-century Dominican, Alan de la Roch, Mary appeared to St. Dominic in 1206 after he had been praying and doing severe penances because of his lack of success in combating the Albigensian heresy. Mary praised him for his valiant fight against the heretics and then gave him the Rosary as a mighty weapon, explained its uses and efficacy, and told him to preach it to others.” (catholicculture.org) From then on more and more religious congregation spread its devotion and more Catholics have experience the efficacy of praying the rosary in their lives! Our Blessed Virgin Mother herself has asked us in her apparitions to pray the rosary daily for the conversion of sinners and of the world! She who is already in heaven knows what is best for us. She encouraged us with the rosary because it is a Christocentric prayer. All its mysteries revolve around the life of Jesus. As we pray it, we are not only praising the Blessed Virgin Mary with the words of the angel Gabriel but we are also petitioning the Father to hear us while at the same time we have the opportunity to reflect upon the events of the life of our Lord Jesus. 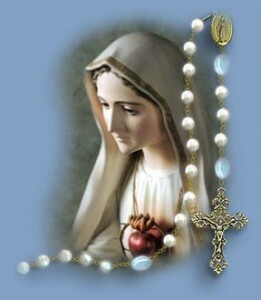 Let us then pray the rosary daily, especially praying together with your family and during this Month of the Rosary!